My daughter recently received a friendly letter, written as a school assignment, from her BFF: Mel's daughter. She was thrilled to open the envelope and read the letter's carefully-printed content. (note to Mel: she is pushing for a sleepover. She hasn't had one in FOREVER!). 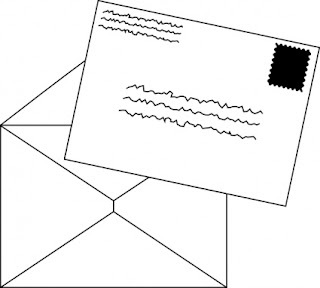 We all remember those school letter-writing lessons (the opening, the body, the closing and signature). Now in this age of digital media, an actual letter printed on paper and put in a mailbox seems as antiquated as hoop skirts and 8-tracks...right? No. I'm happy to report that a well-written letter is a valid (and to me, who's old-school, a preferable) form of business communication. I recently wrote a letter relating a consumer complaint to the president of L.L. Bean. Guess what? I got a prompt response - and a satisfying resolution. In the letter, I detailed a problem experienced after I placed an online order for an L.L. Bean dog bed. Several subsequent weeks passed with no bed delivery, nor any communication from the company. My husband and I wondered: what in the world had happened to the bed? Even a call to a very polite L.L. Bean customer service rep could shed no light. Long story short, the bed was eventually delivered. But, as I wrote in my letter, the experience made us wary of ordering any item that is not expressly fulfilled by L.L. Bean (the dog bed order was handled by an outside vendor). I decided to write this polite complaint letter because it is out of character for L.L. Bean, whose products (and, usually, its service) are typified by quality. I did not ask for anything (which most complaint letters do, but I'm kind of wimpy that way). But I was pleasantly surprised by the voicemail I got a day ago. In it, the assistant to the president apologized for the shipment delay. She had determined that the hold-up was due to an address formatting issue. Oh, and she was sending us a $25 L.L. Bean gift certificate for our trouble. Letters can bring results. E-mails work, too, but there is just something about the physicality of a letter that can't be as easily dismissed. My faith in L.L. Bean as a quality company is re-affirmed by their response. And it's now my (unofficial) New Year's resolution to write to corporations that provide a disappointing experience. Who knows - I may even write letters praising companies/employees that provide a great experience.